St Pascal was born on the day of Pentecost into a very poor peasant family at Torrehermosa, Spain. He was given the name Pascal from the Spanish term Pasch or “Passover of the Holy Spirit”. St Pascal’s early career was as a shepherd but he was known to have taken religious and other books to work and get passers-by to teach him how to read. 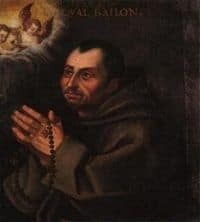 St Pascal was accepted as a Lay Brother by the Franciscans. He chose to live in monasteries saying, “I was born poor and am resolved to die in poverty and penance”. St Pascal lived out his life as a friar in deep devotion to the Eucharist, prayer and penance. Many miracles were attributed to him during his life, which he downplayed, and after his death. St Pascal is the Patron Saint of Eucharistic Congresses. His Feast Day is the 17th May, the day of his death. Pray for us that we may become worthy to receive the promises of our Risen Lord.